Make filling by sprinkling gelatine over the water in a small heatproof jug. Stand jug in a pan of simmering water. Stir until gelatine dissolves, cool for 5 minutes. Beat sugar, cheese and lemon juice with an electric mixer until smooth. Beat in cream. Stir in gelatine mixture. Cut each saviordi biscuit into three. Combine berry/orange juice and Grand Marnier in a bowl. Dip the biscuit pieces in the liquid. and divide equally among 6 tall drink glasses. 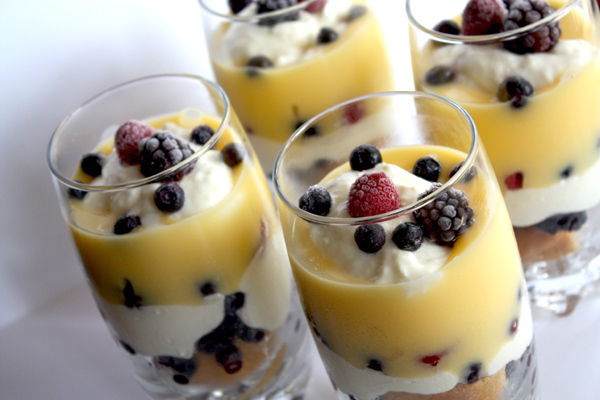 Divide cheese mixture, among glasses and top with frozen berries. Top with some custard and more frozen berries.